We are happy to announce that we will be exhibiting at the British Pig and Poultry Fair in 2016. Taking place every 2 years the 2016 Fair will be on Tuesday 10th & Wednesday 11th of May at Stoneleigh Park, Warwickshire. If you have products or services for the pig and poultry or egg sector you need to be there. Over 300 companies including us will be there offering information, products and services for all on..
Drummotors and More Ltd Will be showcasing our Pig and Poultry specific gearmotor ranges from Transtecno, a moment we have been waiting for! 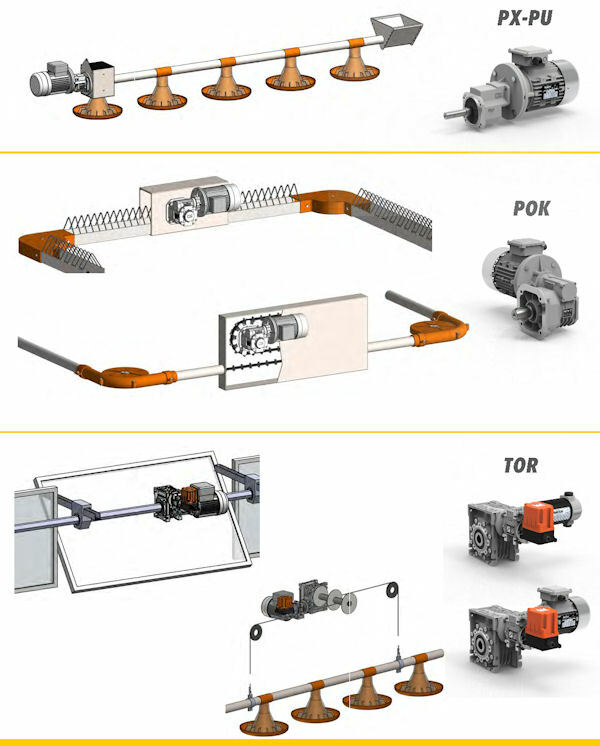 The Pig and Poultry Tecno gearmotor range has been specifically designed for farm equipment. Gearmotors have been made up by combining AC electric motors and single stage helical gearboxes with aluminium housing. A low cost solution , with a high degree of customization . A wide selection of input/output flanges and shafts are available in order to satisfy customers specific demands. For quotes or more information about our Transtecno Gearboxes, call us on 01509 815607 or send us an email through our contact page by clicking here.